After World War 2, Marcel Bloch, the famous French aircraft designer prior to the fall of France to Germany, adopted the covert name used by his brother in the underground and became Marcel Dassault. He developed a number of combat aircraft designs exploiting captured WW2 German aviation research (as did British, US, and Soviet engineers), Dassault turned to the challenge of developing a Mach 2 interceptor that would keep France in step with aircraft developments in Britain, USSR and the United States. The result of the Mach 2 design effort was the delta-winged Mirage III which first flew in 1956. Since that successful milestone, the Mirage evolved into a capable fighter, fighter-bomber, reconnaissance aircraft, and more. The Mirage IIIC in particular was designed as an all-weather interceptor that could perform ground attack missions in daylight. While the Mirage III saw service in a number of air forces around the world, the Mirage gained its fame while in service with the Israeli Air Force, proving more than a match for the latest Soviet designs. While some recognized the Mirage for its operational potential, the real sales were generated on the Israelis' combat record with the type. Eduard has reissued their Mirage IIIC kit first released a decade ago, this time in their inexpensive Weekend format. 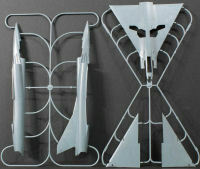 At the time, this kit was the best Mirage IIIC in any scale and it remains the best in 1/48th scale. The best Mirage IIIC in any scale now goes to Italeri's 1/32 scale kit. The kit is molded light gray styrene and presented on eight parts trees, plus a single tree of clear parts. In addition to the markings for these two subjects, the decal sheet also includes a nice set of airframe and weapons stencils. 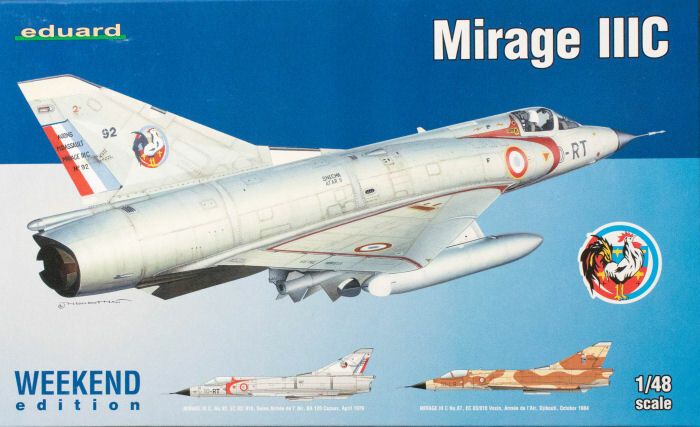 This kit remains the best Mirage IIIC in 1/48 scale and this weekend edition will provide a comfortable build for those less experienced with multimedia parts, but AMS modelers still have access to the detail sets still available from Eduard.